As I was cleaning my house, I noticed a thin layer of dust on my stand mixer. DUST ON MY KITCHEN AID?!? How did this even happen?? Had it seriously been that long since I had baked anything? I guess so! Obviously, I had no choice but to scrub it down and bake something ASAP! =) I need to make nice with my neighbors so I can pawn baked goods off on them. 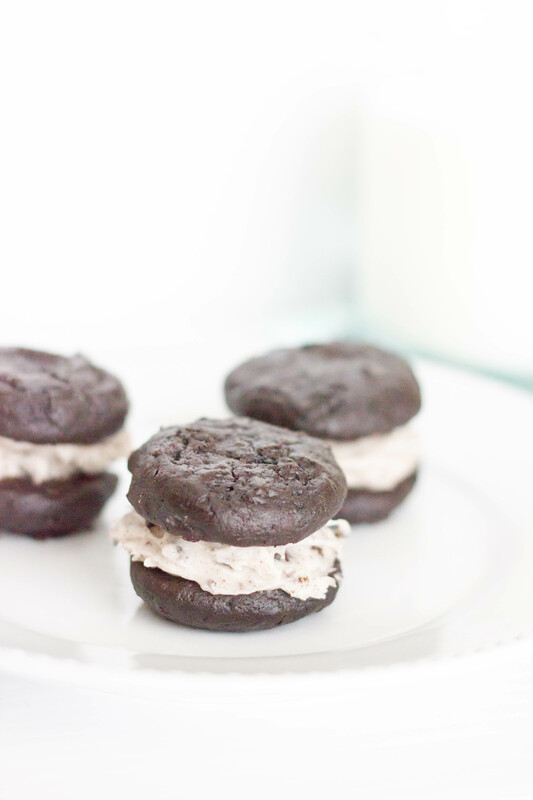 I don’t bake as much lately, because there’s just no way one person can (or needs to!) eat an entire batch of any dessert – even small batches! But sometimes, you just gotta take one for the team ;). 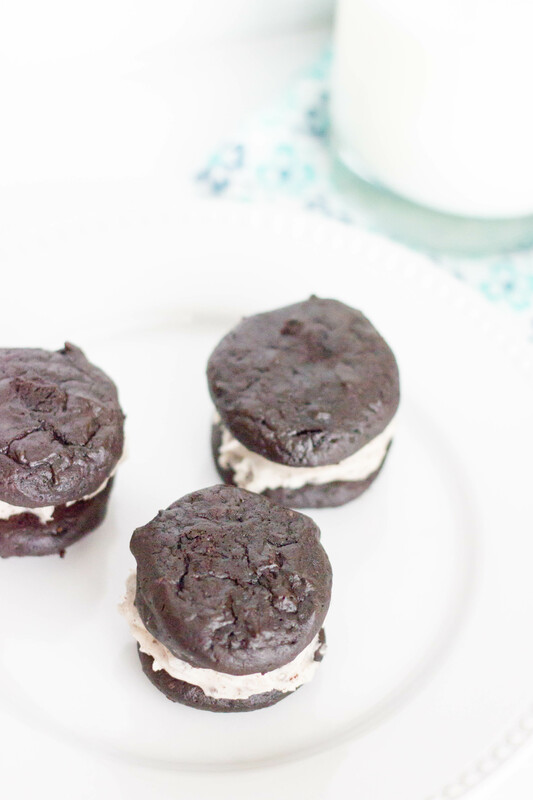 These Chocolate Oreo Whoopies Pies were definitely worth every calorie! 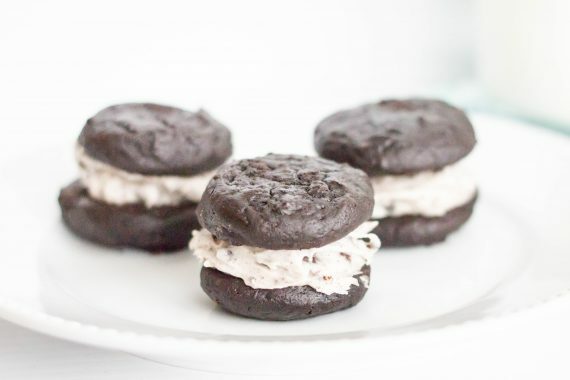 They’re soft, fudgy, and the oreo cream cheese filling is sooo good! They’ll keep for several days in the fridge, so you can stretch out the goodness some =). They’re pretty much perfect. Give them a try! Enjoy! 1. Preheat oven to 400 degrees. Sift together flour, salt, cocoa powder, baking soda, and baking powder. Set aside. Line two baking pans with Silpats or parchment paper. 2. In the bowl of an electric mixer fitted with the paddle attachment, cream butter and sugar until light and fluffy. 3. Add eggs, buttermilk, and vanilla. Beat until well combined. Slowly add dry ingredients. Mix until combined. 4. Using a #60 scoop, place cookies onto lined baking pans, 12 per pan. Bake for 5-6 minutes. Remove to a rack to cool. Repeat with remaining batter. 1. Beat butter and cream cheese together with paddle attachment until light and fluffy, about a minute. 2. Add powdered sugar and vanilla and beat until smooth. Gently stir in crushed oreos. 3. Spread on cooled cookies.